Eddie upset that the police think he's guilty of receiving stolen goods - he can't drop Joe in it, so he'll just have to take the punishment. Des suggests dobbing Trevor in, but Eddie thinks Trevor will dob Joe in anyway. Eddie will just have to take his chances in court, but if he's convicted he'll have no chance of getting residency in Australia. Cody is singing along to her walkman. Adam comes in and suggests that Doug and Pam go to the fancy dress ball tonight. Doug says he can't - Pam has other plans. Adam moans that he's wasted $70 on the costume hire. Cody seems in a better mood today and both Adam and Doug are surprised. 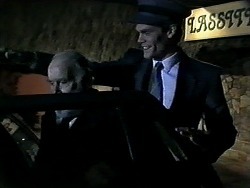 Adam picks up Caroline and her important client. 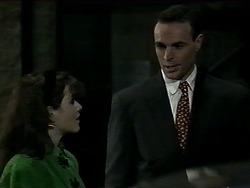 Paul has invited Melanie around to meet Isabella. Apparently she is upstairs. Melanie asks Christina if she's OK, and what Isabella is like. CHRISTINA: Well, I guess you could say she's pretty...in an Argentinian sort of way. MELANIE: Yes, they're very attractive people, aren't they? CHRISTINA: It's all in the eye of the beholder I guess. Which probably could explain Paul's infatuation with her. Christina says she doesn't really understand what Paul sees in her! 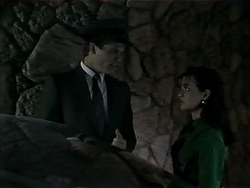 Isabella finally comes down and Paul introduces her to Melanie. She tells warmly her how much Paul values Melanie, and then goes to check on the dinner. PAUL: Isn't she the most beautiful woman you've ever seen? Christina looks most put out. Des and Eddie have joined Paul, Isabella, Christina and Melanie for dinner. They are all getting on very well, but Christina is glowering a bit. Isabella is very friendly and tells them about a night that Paul and I went out to a restaurant in Buenos Aires. While she was in the ladies' room, an American couple mistook Paul for the head waiter and gave him a large tip! Everyone is getting on very well, although Christina is still very quiet. Isabella thanks them all for welcoming her to Australia. She proposes a toast to her new friends. Adam is driving while Caroline chats to her client in the back of the car. He is staying at the Southside Pacific and Caroline is singing the praises of Lassiter's. Adam says that the views from the Southside Pacific are very nice indeed though. Caroline offers to show the client around tomorrow at Arundel Gardens. Adam cheerily says that Caroline and he had a nice picnic there last week! When they arrive at their destination, Adam says they could still make the Uni ball. She tells him to watch his chatting in the car - he's not supposed to talk to the clients. Also, it looks unprofessional if the client thinks they're going out together. Jim pops over to show Doug some pictures from the camping trip - some of them are of Cody and Todd. 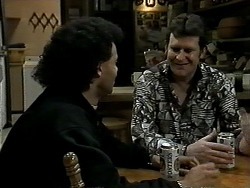 Doug offers Jim a beer and tells him that Cody's mood is much improved. Jim hopes that Todd is coping as well over in Adelaide. Isabella is telling them about Argentina - it's a beautiful, but troubled country. Christina is still very quiet. Isabella asks them about the beaches and Paul says he'll take Christina the first chance he gets. Adam has put on his Anthony costume under his suit. He hasn't quite finished changing though when Caroline comes back. She orders him out of the car to open the door and he is forced to obey. Caroline is speechless! Eddie tells Des that he thinks Isabella is "the most stunning bird" he's ever seen. Des doesn't think she seems like Paul's type - he liked her, though. Eddie wonders about Christina - she seemed a bit down in the mouth today. 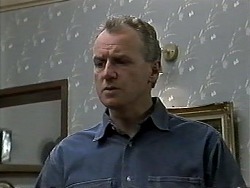 Des asks Eddie if he's made a decision about Joe yet. He says he's decided to face the music and go to court. Des says Eddie is innocent, but Eddie doesn't think the judge will believe him. Christina and Melanie are laughing at Adam in his Anthony costume. Apparently Caroline isn't very chuffed, but the client loved it and gave Adam a $5 tip! 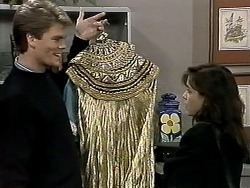 Caroline comes out in her Cleopatra costume - she's decided to go to the ball after all. CHRISTINA: Maybe I should have worn something like that in front of Paul. MELANIE: Christina, I know how hard it must be for you, the way you feel about Paul, but I think you have to face facts that he only has eyes for Isabella. CHRISTINA: Why not, she is beautiful. Don't tell anyone I said that. MELANIE: I think you're being a bit unfair. Isabella really is a lovely person. I can understand why you're upset, but it's not her fault. I don't think you should be so hard on her. Paul has brought Isabella around to see Jim. While they're chatting, Jim goes to answer the phone. Isabella tells Paul that his father and all his friends are wonderful. 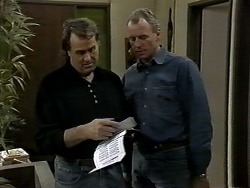 Jim comes back from the phone and tells Paul it was Annette - Todd has gone missing from Adelaide. 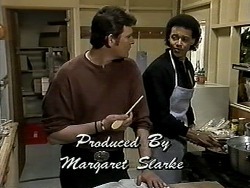 Paul wonders if he's making for Erinsborough, so Jim goes off to talk to the Willises. Cody and Doug are watching a late-night movie. Cody heads off to bed, taking some biscuits with her. Cody shuts the door and then gives the biscuits to Todd, who is lying on her bed! CODY: It's really great you being here, Todd, I can't believe you did it! TODD: Well, I had to see you, I was going crazy! CODY: Mmm, I know the feeling! TODD: Question is, what do we do now? CODY: I don't know. And I don't want to think about it! We're together, and that's what counts! TODD: Yeah, but for how long? Look, if I get caught I'm in deep trouble. CODY: Todd, do you regret running away and coming to Erinsborough to see me? TODD: No! No way! I couldn't spend another day without you.